A combination of lean beef, vegetables, and spices gives this delicious mixture a nice boost of fiber, protein, and healthy fat. Chopped meat contributes with a good amount of protein which will keep you full for hours, while vegetables add a perfect amount of vitamins and minerals promoting health and well-being. Having that said, I think it’s time to give this combination a try! Slice frozen striploin into wafer thin slices. Set aside. Combine stock, ginger, star anise onion, fish sauce and chilli in a large deep pan. Bring gently to boil, reduce heat, and simmer on a low heat, for five minutes. Remove star anise and discard. Reheat broth until just boiling. 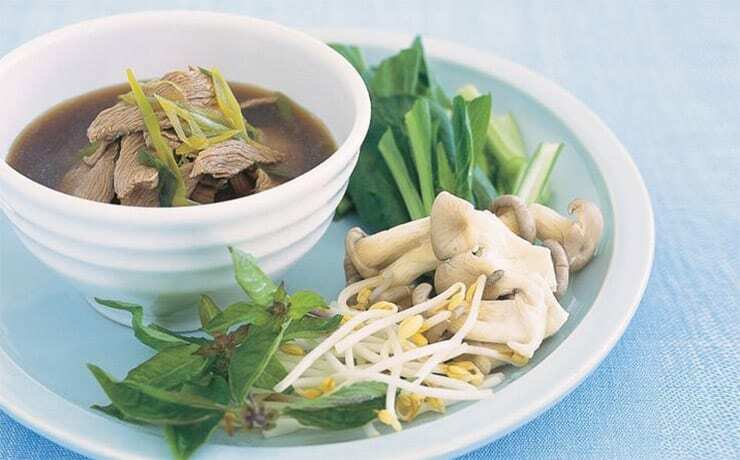 Add beef slices to hot broth with vegetables. Simmer over a low heat for 2-3 minutes until just cooked. Serve with thinly sliced spring onions and Vietnamese mint or basil.